Passbook is predicted to become a major player in the mobile wallet space in the next few years. This trend will increase the necessity for high performance barcode scanners that can not only read fast but also validate the barcodes within passes with servers. So, here’s a run-down of codeREADr’s application as a passbook scanner. When inserting data into the barcode of a pass, it’s important to understand the capabilities of what your barcode reader can scan and how it affects the performance. QR readers are only able to read certain amount of data because the data is represented as pixels. The larger the amount of data, the longer it could take for a scanner to be able to decode it, and the closer the scanner will have to be to the code in order to view all the dots separately. We’ve decided to put these limits into perspective by putting codeREADr and codeREADr SD Pro to the test. 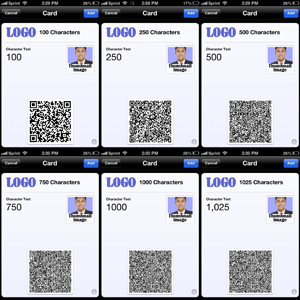 We created six sample passes, each containing a QR code with a different amount of data. First, we tested to see if our scanner was able to read a QR codes with that amount of data and secondly we tested to see on average how long it took our scanners to both focus the camera on the barcode and decode it. We did not test distance. All of these scans were performed at close range.